Next up in the series on Jerky Hut is this Teriyaki variety. 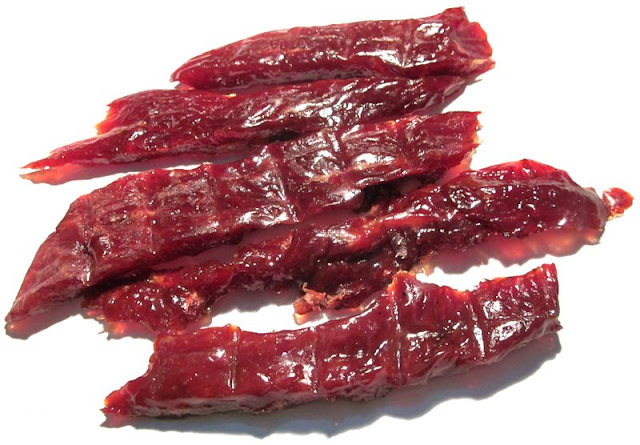 See my previous reviews on their Cowboy Beef Jerky and their Golden Nuggets Beef Jerky. Jerky Hut is a brand of Whiskey Hill Smokehouse, LLC, based out of Hubbard, OR. The brand which is often seen at boat shows, gun shows, car shows, and trade shows of every kind, was started back in the 1980s. Whiskey Hill Smokehouse runs its own USDA inspected facility. 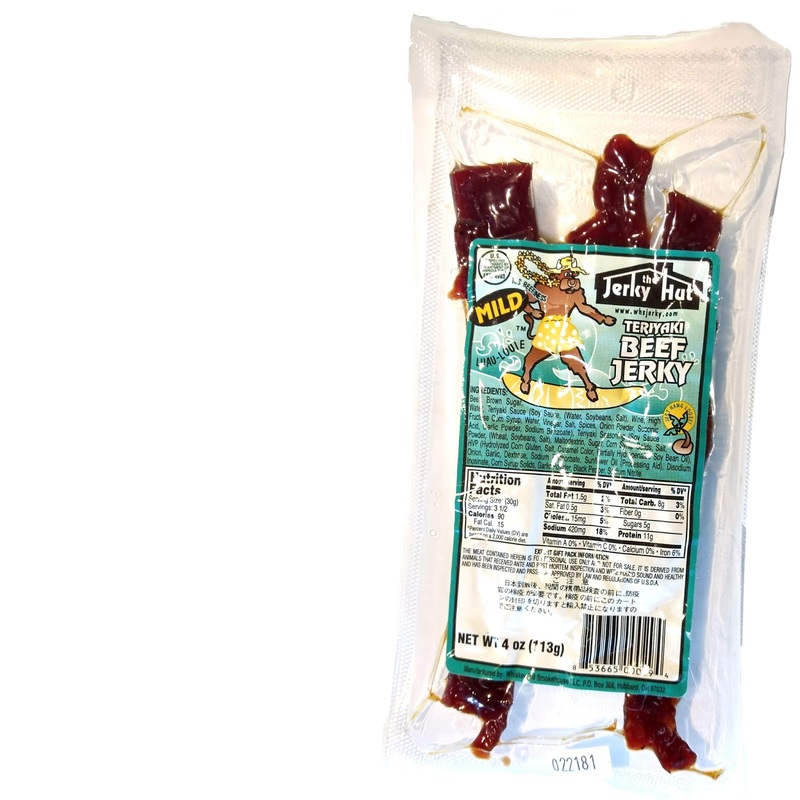 This Mild Teriyaki is described by the company as thick cuts of beef jerky seasoned with their special tropical teriyaki goodness, and is one of their top sellers. Beef, brown sugar, water, teriyaki sauce, teriyaki seasoning, onion, garlic, dextrose, sodium erythorbate, sunflower oil, disodium inosinaste, corn syrup solids, garlic powder, black pepper, sodium nitrite. The first thing I taste from the surface of these pieces is a thick sweet teriyaki sauce, and a light meaty flavor. The chewing brings on more definition of teriyaki, with overtones of ginger. The natural meat flavors come on lightly. For being dubbed "Mild Teriyaki", it fits that bill. It is indeed mild, with no spiciness to speak of. The teriyaki also tastes like "real" teriyaki in that it has the strong sweet, the soy sauce flavor, the fermented character, and touches of ginger. Otherwise, the primary taste profile is a very sweet, classic teriyaki sauce, with a light natural meat flavor and a moderate level of salt. The meat consistency comes in slices of whole meat, sliced into thick strips ranging between four to six inches long. They are relatively easy to bite off chunks through a semi-moist chewing texture that feels like real steak. I didn't notice much stringiness and no unchewable tissues. These strips feel like pure meat. This Mild Teriyaki beef jerky from Jerky Hut offers a classic teriyaki flavor that's tastes more true to the Japanese style than most national brands of jerky. On the other hand, it's also a one-dimensional flavor in that all you get is teriyaki flavor and little else. 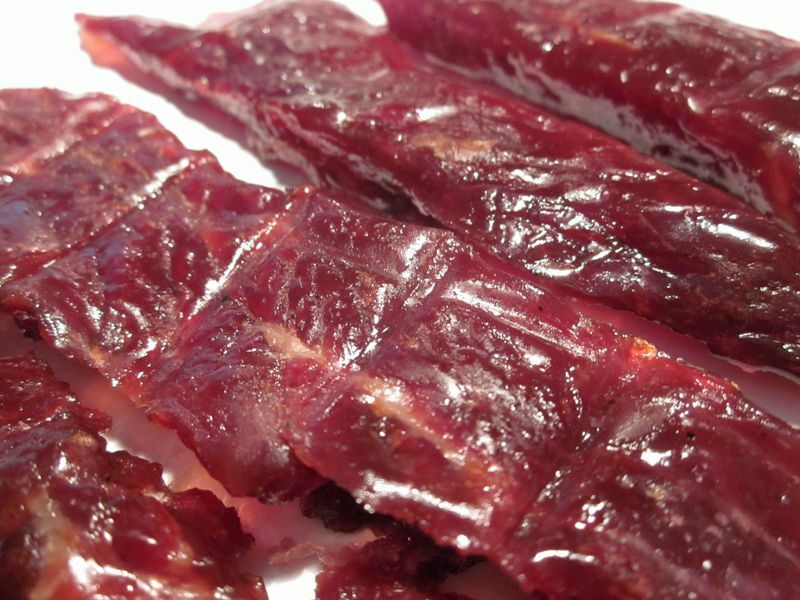 This jerky does, however, offer up thick strips of whole meat, that feel and chew like real steak, and are easy to bite off. 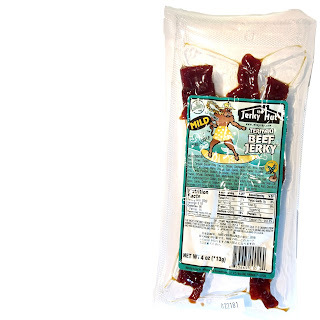 Overall, this is a great jerky for folks who like a simple Teriyaki style beef jerky on thick, meaty, moist strips.